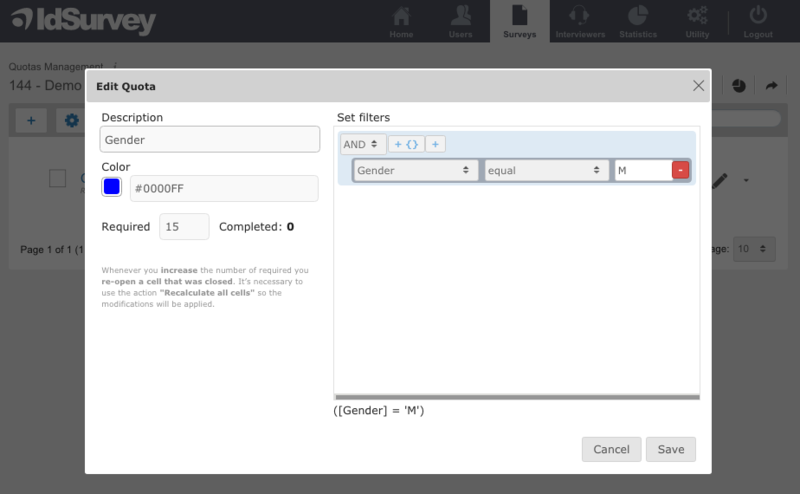 With IdSurvey you can quickly set quotas to check data collection focusing on the quantity requested. IdSurvey manages both simple and stratified quotas on an unlimited number of parameters. You can set quotas on contact variables that are already known and/or on variables collected during the interview. To set a quota on an answer option you have to use the function “Update contact field” that will write or update a variable in a field of the contact database entry associated to the current respondent of the questionnaire. The software automatically runs a control in the questions where “Update contact field” is set. If the contact belongs to a quota that is full, the interview will be stopped. To set the quota on an answer using the “Update contact field” function in the GUI, click on the gearwheel button of the answer option you want to use to create the quota and enable “Update contact field”/“Update quota”. Now select the field of the contact database you want to use for the quota from the dropdown menu and insert the value to be written in the contact database in the text box below. Once the answer is set, you will have to go to the “Quota Management” page, under the “Management” icon of the survey menu in order to create the quota. In order to do it manually, click on the “+” button on top left. In “Description” insert the name you want to give to the quota (empty spaces are not allowed), select a color for the quota and enter the number of completed interviews requested before closing the quota under “Requested”. 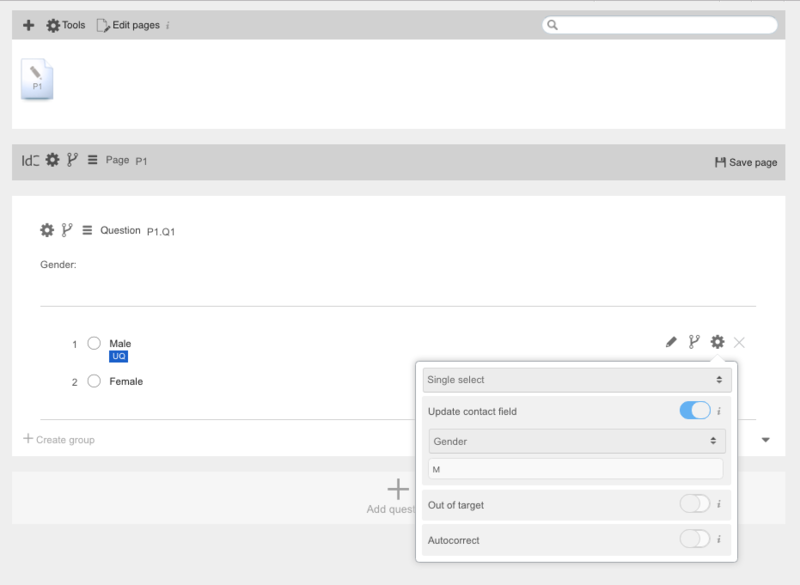 On “Set filters”, select the field you want to use to build the quota from the first dropdown menu and then write in the text area the value used in the question. Alternatively, you can also import quotas using an Excel file. To know more on quotas consult other articles of this Knowledge Base on Quotas Management.